By now, everyone knows what The Last of Us is. 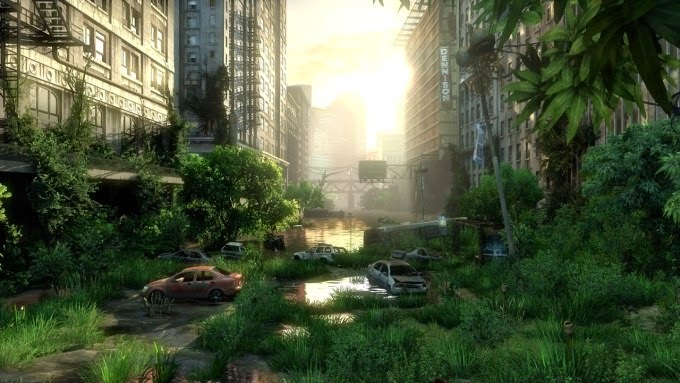 It is a post-apocalyptic third person survival-horror action game. It is the most critically acclaimed game of 2013. It is one of the most notable games of the last console generation. According to some it's even a contender for the best game of all time. All this from the well loved folks at Naughty Dog who also brought us Crash Bandicoot, Jak and Daxter, and Uncharted as well. It is for these reasons that I decided to give the game a whirl, knowing full well that this type of game is not at all my cup of tea. And so here I am today, giving you my impressions of a game that I played primarily because of the hype. One of the things that gets talked about most is probably the game's narrative, so let's start there. In a lot of ways the tale that The Last of Us weaves is actually very unoriginal. It's hardly the first work of fiction to explore the the lows and highs of a post-apocalyptic society, and what actually happens is rarely unexpected. What the game does do very well however is weave narrative into the gameplay. You learn just as much about Joel from his actions then you do from his words. What's more, these are really your actions. All of his most brutal moments come at your command, and watching Joel beat a man to death with a brick at your behest can feel legitimately disturbing. And that's the point. Joel is a bad person, and unlike a lot of games where the anti-hero is glorified as some badass, there is no pretending that Joel is doing anything more than what he thinks he needs to in order to survive. Now, one of the things that this narrative helps accomplish, is a very strong atmosphere. Together with some very well built environments and a well written script, it's easy to get sucked into this dreary world. It looks good, but it also feels good, and believable to boot. Said world is, unsurprisingly, mostly empty (which is in itself a form of worldbuilding), and yet it seems like there is always something interesting to look at or for the characters to discuss. The environments feel very organic, and so do the actors' performances. Together between the games' narrative and atmosphere it feels like it is constantly taking you feel a ride, and I found it pretty common to experience genuine shock or relief or terror when it was appropriate. However it's interesting to note, these moments were always as a result of gameplay. There are some moments which essentially become glorified walking simulators, but they still make you feel the weight of the games' situations far more than the cutscenes do. The game manages to provide a fair variety in these situations, too. As the game goes on it introduces new things to worry about at a fair pace. Not a great one, but a fair one. Some sections drag on longer than I would like, but in general it feels like things are paced such that they never get overly tired. After playing for a while however, things can start to feel pretty formulaic (forage > infected > forage > thugs). 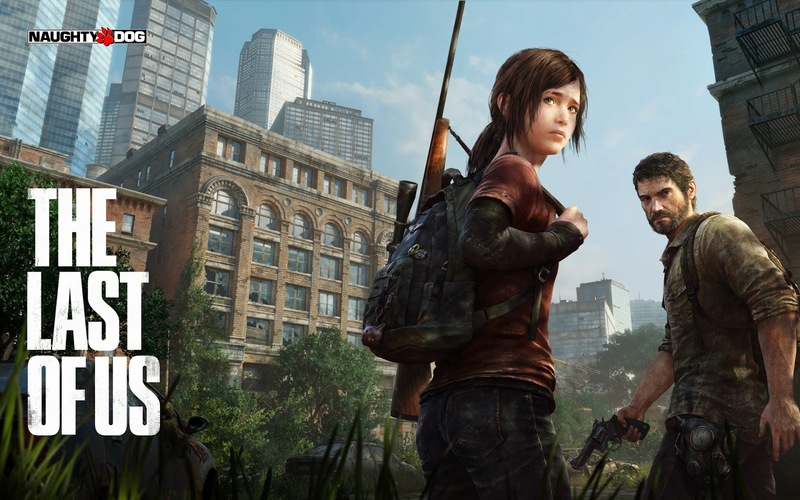 Where The Last of Us does this better than say, the Uncharted games, is that things like puzzle solving and platforming feel like they blend into the foraging section of the game much more organically. Or perhaps the other way around. Because you are always looking for resources, and you aren't spending your time climbing up giant statues and solving ancient puzzles, it feels like you are really just navigating the environment rather than playing "the platforming segment". 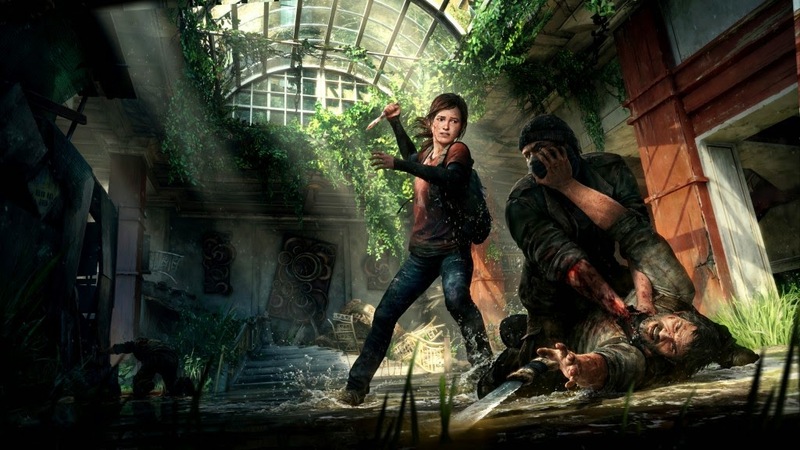 The Last of Us does have much less variance in puzzles and platforming than the Uncharted games however, and so with lass variance in things to do, the formula can get old quicker in my experience. Foraging in itself however, is actually pretty grand, too. I think I can honestly say that it is my favorite part of the gameplay. It feels like hunting about the environment for materials is a legitimately very important part of the game, which helps sell the survival aspect of this broken world very well. Whereas in other games exploration tends to be a way to get bonuses that give you prestige or extra power, The Last of Us makes exploration feel like a necessity. Exploring isn't a way to become more overpowered than you would otherwise be. If you don't find enough ammo or bits to make the med packs you need, you will die. Or at the least you will make things very hard for yourself in the coming sections. It also helps that the environments are legitimately interesting to explore, for the reasons stated earlier. Unfortunately though, this is more or less where the gameplay and I stop seeing eye to eye. Now I'm not saying that the gameplay is bad. If anything I've spoken pretty glowingly of it for the past several paragraphs. However I also mentioned how The Last of Us isn't really my type of game. Try as I might, I could never really find much love for the game's stealth-y horror-y elements, and they typically take precedence over the action-y survive-y bits. I do appreciate the narrative value that comes with the stealth-centric gameplay. However, any narrative gains from this is probably offset by how completely oblivious enemies are to your allies running all over the place and making a monolithic din. But honestly, I just felt like I just wanted to shoot things most of the time. This is in part because of my own impatience, but probably also in part because the game can be frustrating at times. It's checkpoints are not very forgiving, and it's not unheard of to die for stupid reasons like say, your partner physically blocking you from going where you need to go. All said I just found the combat to be generally frustrating and not really for me. So where does all of this leave us? Well, we have a game that is spectacularly put together in just about every conceivable way. The Last of Us doesn't really innovate in any way, but it is a testament to the value of polish and attention to detail. To be honest, I'm still unsure of how much I actually like it, but I do believe that it deserves most of the accolades it has received, and that whatever my feelings are on the game, it's hard to deny that it is a fantastic piece of work. I think it's interesting that for a lot of the game I wished I could just experience it as a movie, and yet at the same time, a movie would not have had as strong a narrative without intermixing with the gameplay. Regardless of how much I might have enjoyed the game, it is a strong case for the strengths video games have over other forms of media, for this reason. 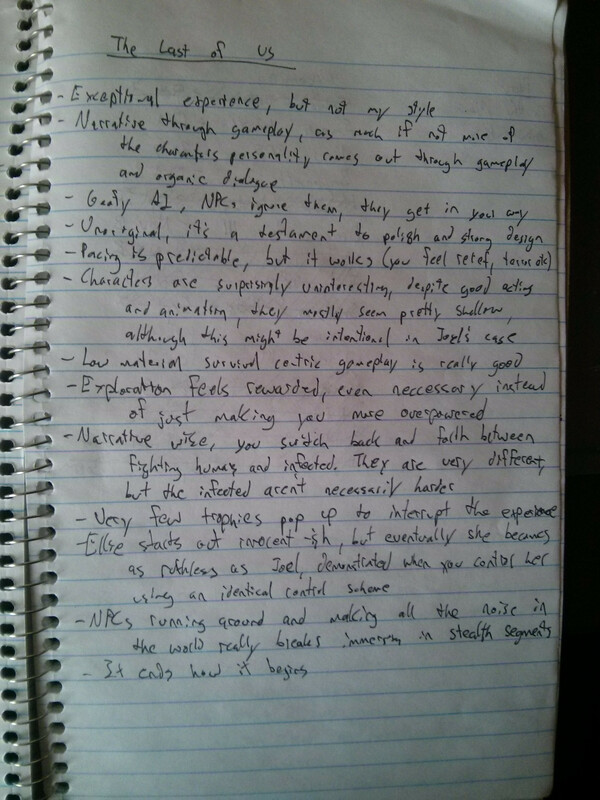 Here are some notes I took on the game.